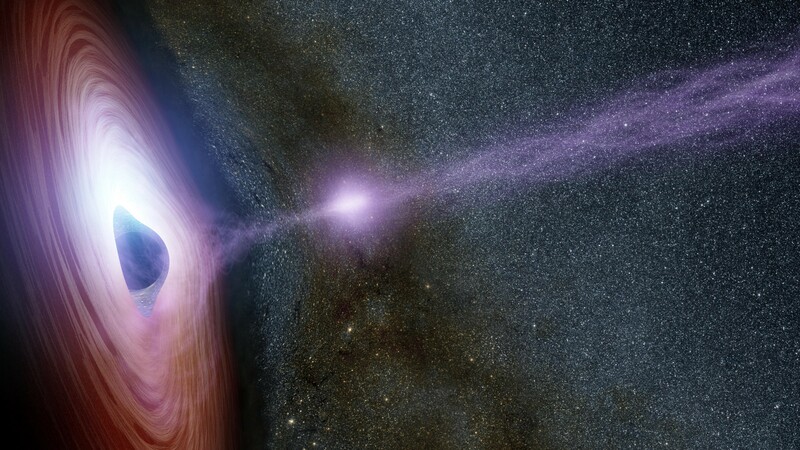 A black hole generates x-ray light (shown in purple) as material falls into it. Image by NASA/JPL-Caltech/R. Hurt. Populating the Milky Way are an estimated 100 million black holes of varying sizes and strength. At its heart, for example, the galaxy harbors Sagittarius A* at 4 million times the mass of the sun, enormous and dizzying and elusive as it spins surrounded by possibly thousands of smaller black holes, each 5 to 30 times the mass of our glimmering and familiar sun. Yet despite their tremendous power and size, these objects live wary of detection, invisible except in cases when they consume gas from a nearby star and produce x-rays as the material falls inward, heated and then gone — slipping somewhere beyond the point of no return. Yet rather than seeing these as objects to avoid in our venture through outer space, for many years scientists have speculated on the possibility of a very different use for black holes: as a method to help us become an interstellar species. One of the biggest problems with current chemical rockets is, of course, their need to carry propellant. The longer the voyage, the more propellant needed, in which case the rocket itself must be larger and so on and so forth in a cycle which just doesn’t make them feasible for interstellar travel. But what if instead of carrying large amounts of fuel ourselves, natural astronomical bodies became our energy sources — our propellants into the expanse of the universe? In this trajectory of Voyager 2, the craft can be seen speeding up during its flybys of Jupiter and Saturn. Image by HORIZONS System, JPL, NASA. We already do this on some level by employing gravity assists. Using the gravitational field of a moving planet, a probe can conserve its own fuel and instead use energy from the planet to gain momentum, allowing it to move forward without using its own reserves. Voyager 2 was provided a gravity assist from Jupiter which allowed it to reach Saturn later on. When the probe interacts with the planet’s orbit, it alters the speed and course of the probe (these gravity assists can also be used to slow down as well as speed up). The problem with gravity assists from our own solar system is that probes can only accelerate up to twice the speed of the planet and planets simply don’t move anywhere near the speed of light. A paper released just weeks ago by astrophysicist David Kipping of Columbia University builds off of a concept introduced by Freeman Dyson in the late 1900’s. Known as a Dyson slingshot, the idea is to use the energy of binary star systems to accelerate a spacecraft to relativistic speeds. But the maneuver isn’t for the faint of heart. The gravitational slingshot involves approaching one of the stars in a careful trajectory, not only avoiding the intense gravitational forces and the star itself, but also withstanding the radiation abounding from the event. It is a dangerous and formidable method of acceleration, even if it would be an efficient source of energy for the craft. Some stars can move up to 33% the speed of light (100,000 km/s) after being ejected from their galaxies by massive black holes, for example. Kipping proposes a safer way to use black holes to our advantage. If there is a binary star system where both stars have become black holes orbiting at high speeds, by firing a laser at the incoming black hole it allows gravity to bend the laser around in a loop until the light reaches your craft once more. The initial firing of the laser (a stream of photons) gives the ship a slight thrust and the stream of photons then goes on to gain energy from the black hole. When it gains energy, the light won’t move faster than before. This is because light must always move at the same speed. Instead, the light gains energy and becomes blue-shifted, changing frequency and returning to the craft with more energy than it first had. Reabsorption of the light gives your craft another thrust. This can go on, according to the math in the study, until your acceleration is 33% faster than the speed of the black hole. The light will appear distorted into a kind of halo around the black hole, a testament to the effects of gravity and giving way to the name “halo drive”, a futuristic vision of space travel. This is similar to the ongoing Breakthrough Starshot project which uses lasers to send spacecraft to our nearest star system, Alpha Centauri. The spacecraft are a fleet of small light sails (nanocraft) prepared to make the 4.3 lightyear trip. Propelled by the energy from the lasers, the fleet will be able to move at up to 20% the speed of light. Kipping does believe the halo drive is a collaboration between the idea behind lightsails and the idea of the Dyson slingshot. 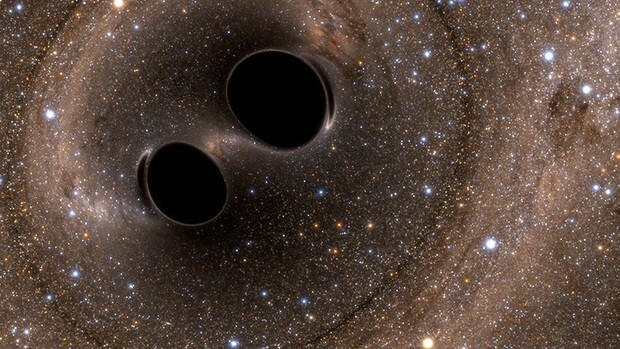 This depiction shows two black holes colliding before they merge. The halo drive requires a craft to be at a distance 5–50 times the diameter of the black hole in order to work. Once within range, the drive could allow even crafts the size of a planet to travel at relativistic speeds. Image by SXS, the Simulating eXtreme Spacetimes project. Black holes, then, could be significant locations for advanced alien civilizations. Kipping suggests that if black holes are merging more than expected, it might be a sign that halo drives are being used by these civilizations in their travels. By examining their orbits — especially those of binary black holes — we could encounter the strange signature of other life in the universe. Before we can take advantage of these star systems, we’ll need to find a way to travel to them first. There is the added disadvantage that black hole pairs can’t hold relativistic speeds for long, though the paper chose to focus on them because of their great amount of rotational energy. The faster the rotation of the black hole, the more energy available for the halo drive. However, individual black holes are also capable of helping us accelerate to the desired speeds. In his following paper Kipping plans to address how we might reach one of these black holes. The closest one we know of is titled an ominous “V616 Monocerotis”, spinning at a distance of 3,000 light years from Earth and containing the mass of up to 13 suns. But black holes don’t show themselves readily; rather they exist in a very quiet way, only giving occasional notice of where they are and only when conditions are right. There are likely many more of them among the millions already predicted to exist in the Milky Way, some of them closer than we know, spinning silent and dark just outside our current reach.